As the Head of European Design for North Sails, Dave Lenz likes making sailboats go a little faster. He is also their new class leader for the Merlin Rocket. He spends his workday with his “fingers in lots of pies,” developing sails for big boats like the TP52 and Fast 40. Now, on the weekends, he’ll be trying to make a Merlin Rocket go a little faster—with his wife as crew. Dave started sailing as a small child and then moved into Optimists and up through the British Youth Squad system. Olympic skiff sailing eventually led him to big boats, which led to a few jobs in sailmaking before he landed at North Sails in 2006. Solid results in the Merlin Rocket will have to wait for more time in the boat. The Merlin Rocket appeals to Dave because it is a development class and tweaky enough to keep his interest. Newer designs with less rig controls come and go, Dave says, because a lot of people like to be able to fiddle with their boat. 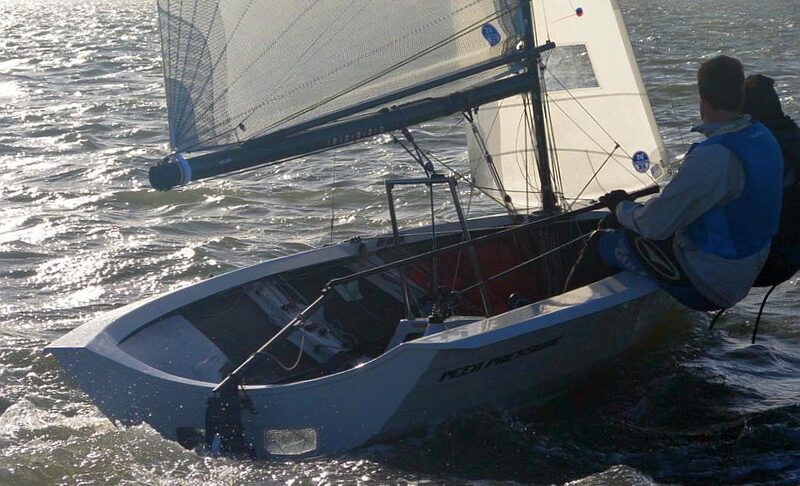 For a sail design expert, there’s also a fresh challenge written into the Merlin Rocket class rules. A new mainsail model will launch very soon, Dave says. Dave is also focusing on other challenges to prepare for next season. Dave steers and his wife crews, which he says suits the boat well. Meanwhile he’ll just keep trying to make big and small sailboats go faster, seven days a week. Dave Lenz is Head of European Design at North Sails in Gosport, UK.